Part of the CAT’s mission is to help maintain trails in and around our community. 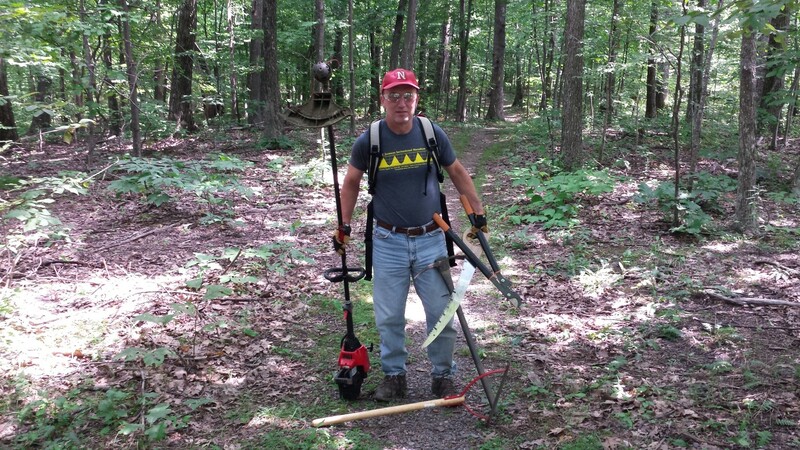 Active CAT-club member Bob Clouston spends a lot of time maintaining trails on the AT and other trails near his residence at Wintergreen. In this post, we talk to Bob about his trail work. Bob , where do you do trail work? 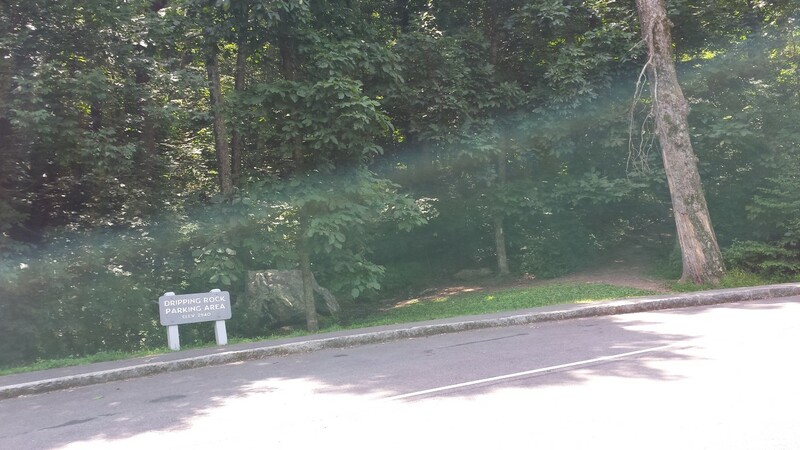 I maintain 3 trails at Wintergreen Resort, and a little over one mile of the AT from Dripping Rock north to the Humpback picnic area, plus the blue access trail from the AT to the picnic area. Dripping Rock is where the AT crosses the Blue Ridge Parkway at about mile 9.6. Once in awhile I’ll join a work party elsewhere, but this work keeps me pretty busy. One of the reasons I chose to move to Wintergreen in 2001 was the 30 miles of trails around the resort, including a 14 mile perimeter trail. 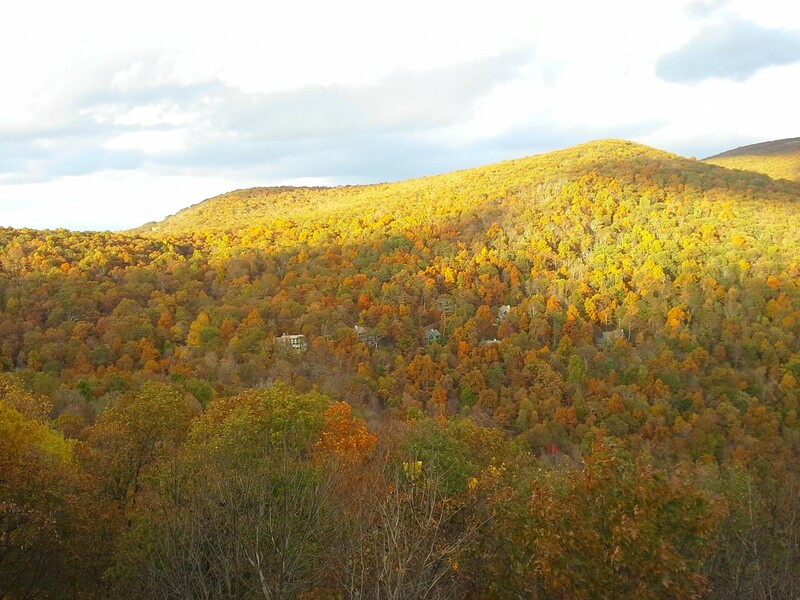 A couple years after using the trails, I came to realize that The Nature Foundation at Wintergreen maintains them with the help of volunteers, so I asked how I could help. I was assigned a trail, and as they realized I was eager and reliable, I was given more trails and also helped out with some larger projects. As I got more involved, the volunteer coordinator at the time mentioned that he maintained a section of the AT and I said I’d be interested in that too. I was able to get the Dripping Rock section accessible from Wintergreen so I don’t even have to drive off the mountain to work my section. In fact I can even see my section from my back deck, though I can only make out the trail in the winter. 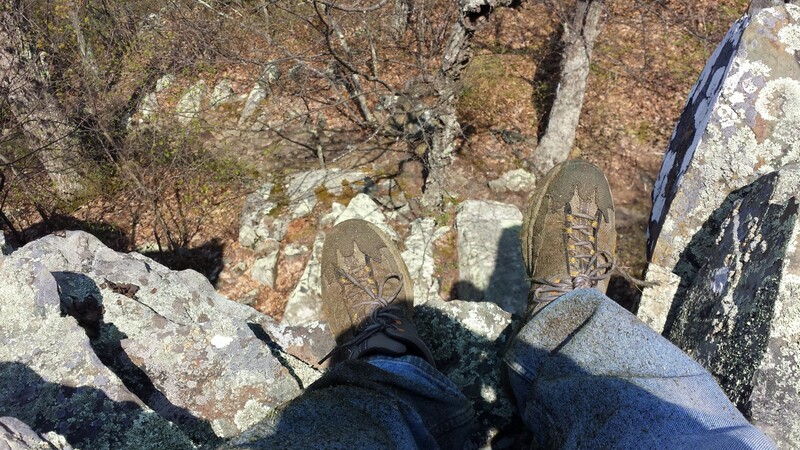 The goal is to keep the trail safe and enjoyable, and wide enough for a hiker to not brush up against anything, so they won’t collect ticks or brush up against poison ivy or other scratchy plants. We also look high, knowing that some parents will have kids on their shoulders, and certainly don’t want them getting slapped with a branch. 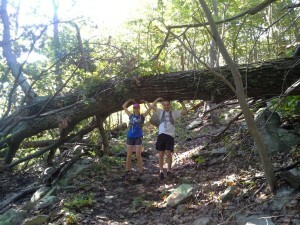 On the AT, I weed-whack my section as needed. I usually do this about four times a year, especially early in the season, but once the tree canopy has filled in and foot traffic has increased, the growth is much slower. At least a couple of times a year, I also use a pick mattock to clear out the water bars, those annoying but useful trenches you’ll see that channel water away from the trail to prevent erosion. I also use loppers to keep the taller growth off the trail, and a handsaw to clear limbs and small trees downed on the trail. I report bigger downed branches and trees it to my supervisor for a sawyer crew to handle with a chainsaw. AT trail-clearing rules require safety training to use a chainsaw; I haven’t done this yet. That said, I’m willing to take on tree-widths of up to a foot or two with my good handsaw so that someone doesn’t have to drag a chainsaw deep into the woods. Finally, I’ll walk my section as much as possible to see that all looks well, flick off the dead fall, and pick up any trash I see. The Old Dominion Appalachian Trail Club (ODATC) — based out of Richmond — maintains the AT from Reeds Gap to Rockfish Gap, which includes my section. The ODATC volunteers make monthly work trips for larger projects such as trail rerouting around problem areas, making new water bars, maintaining the Paul Wolfe shelter, clearing storm damaged areas, trail blazing, and just keeping up with section maintenance. I’ve joined them for a couple of those efforts, but mostly I just work my section on my own time. I do the same at Wintergreen except that The Nature Foundation has an employee and sometimes an intern to weed-whack, which saves me that work. I tend to take part in the “elephant” projects, where they need some strong backs and many hands for major work, similar to the ODATC weekends. For example, we fight an ongoing battle to keep the creek waters in the Shamokin Springs nature preserve contained and off the trails. In the spring we dredge parts of the creek, free blockages, and try to shore up the banks. We also occasionally reroute trails throughout the resort if a problem has developed, rehab foot bridges, and take trash bags out and clean up from where bears have taken trash out of dumpsters, or storms swept junk into creeks. My mindset is that if there’s an issue with my trail, I either have to take care of it or get help with it, because no one else may do it. What is the most satisfying part of doing trail work? 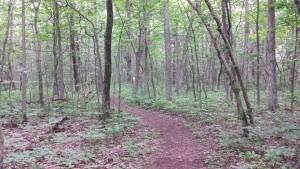 It’s just good knowing that I’m taking part in keeping the trails open for everyone, especially on trails I use myself. I take a lot of pride in looking back at the trail I’ve just worked on and knowing it is something I would enjoy hiking or running on. I also like when hikers come upon me doing the trail work. Nearly all of them thank me for the work, especially the AT thru hikers. Everyone appreciates a compliment, right? Back when the UROC race started and finished at Wintergreen, we had a trail that came near a stream bank that was badly eroded and not safe for 100+ runners at race speed. We rerouted about 1/3 of a mile of the trail in time for the race, and it was rewarding to run the race knowing I had built part of the race course and made it safer for everyone. Volunteering is also a a great way to meet other trail fans, and find out about other trails in the area I might not have discovered. How can other CATs get involved with trail maintenance? My advice is to get your feet wet taking part in a work party. Usually tools are provided, so all you need are work gloves. If you find you enjoy it, you might look for a trail to adopt and maintain regularly, or just continue to volunteer on work parties if you don’t want to make a regular commitment. For Charlottesville people, an obvious start is the Rivanna Trail, managed by the Rivanna Trail Foundation. There are periodical emails that go out to the CAT email list for Rivanna Trail work parties. Come out for one of them to get started, or email to ask what you can do another time. The Charlottesville Area Mountain Bike Club (CAMBC) also does a lot of work on Charlottesville-area trails and is often looking for help on work days. The AT has sections maintained by different clubs. Shenandoah National Park and a long section north is maintained by the Potomac Appalachian Trail Club. As mentioned, Reeds to Rockfish is the domain of the Old Dominion ATC. Tidewater ATC keeps up the AT south of Reeds including the Priest and Three Ridges.. Go to the websites for those clubs and look for volunteer opportunities. I can help get you started with ODATC if that’s where you want to work. Other trails may be under the jurisdiction of the national, state, county or city park services, the forestry service, or private groups such as the The Nature Foundation at Wintergreen. Trail head signs may also give information, and of course Google is always a great place to start. Many trail races need people to go out and get the trails in good race shape, so you can always contact a race director for an upcoming race and see how you can help. I know there are other people in the club who do trail work, and I apologize for not being able to name everyone, but if you post interest on our email list, I’m sure they can offer opportunities. Even if you can’t get out to actually work on it, you can report problems. If you see trees down, or perhaps a safety problem such as erosion on a narrow cliffside trail, try to find the managing group and report the issue. Be as specific as you can with the location and distance from a trail head and other landmarks so that a work party knows where to go without having to drag equipment around searching for the problem. I would love to hear of any issues on the AT from Reed’s to Rockfish so that I could report the issues to the ODATC or take care of it myself. Pictures of the damage are helpful if you have your phone, like this one below where Becca and Marc are either lifting a tree off the trail, or showing just how large the tree is so the sawyer crew knows what to expect. Of course it’s always a Good Thing to pick up trash on the trail wherever you see it, and obviously leave no trace yourself. Great question. To me, it’s mostly common sense. If I have a doubt whether something is safe, I won’t do it alone. For example, no sawing of trees that may be spring loaded and release when I’ve freed the bind. Any group worth working for will have guidelines and educate beginners on safe practices, and make safety their #1 priority. The rules preventing me from taking out a chainsaw is a good one, and in fact no one should be out in the woods alone with a chainsaw. I always wear gloves, safety glasses and long pants when weed-whacking, and sturdy trail shoes or boots. I’m constantly looking up and around to make sure no hikers are approaching while working. I carry a phone and plenty to eat and drink, and take breaks to avoid sloppiness from fatigue, especially on hot days. Watch the weather to avoid being caught on a ridge in a thunderstorm. Keeping tools well maintained is important too. Break time! Snack break on the rocks above the trail. Thanks Bob! We hope this encourages others to get out if they can and help out on some trails, whether it’s taking part in an occasional work party, or adopting a trail.